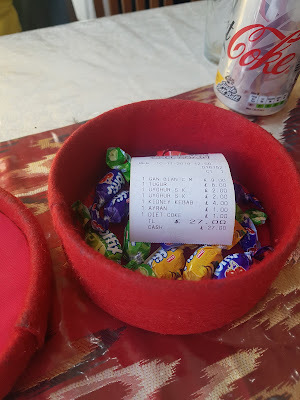 There was a time, just after I started writing this blog, where I would excitedly scour Time Out (before it became a free sheet I still had a paid subscription) looking for exciting restaurants and places to eat. Holidays would be meticulously planned around local specialities, the more outlandish (AKA inedible) the better, and birthdays and anniversary's would be spent in fancy pubs and restaurants, preferably the kind you could blow a months wages getting horribly drunk on fancy cocktails and forget what you'd actually had for dinner. While increasingly real life has impinged on this approach somewhat, mostly my living breathing moments still revolve around what I'm going to put in my mouth next (behave). And while I've long since eschewed all the trendy places and the hype - currently my money is going on far more prosaic things; most recently repairing my oven. If I haven't got money for anything else, at least I can heat up things at home - I still love adventuring anywhere in search of a good feed. 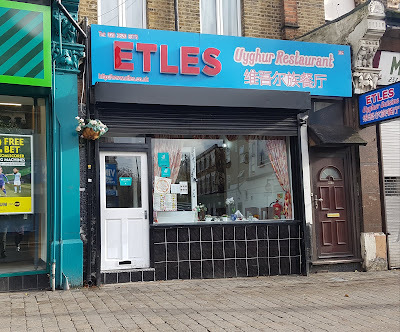 Which is how we ended up on the streets of Walthamstow on a sunny Saturday morning, in search of Etles, an unassuming-looking restaurant that is currently on the 38 essential London restaurants on Eater. An unassuming place on the High Street, owned and run by Turkic Muslims from Yili in the far west of Xinjiang, it's also the first authentic Uyghur restaurant in town. 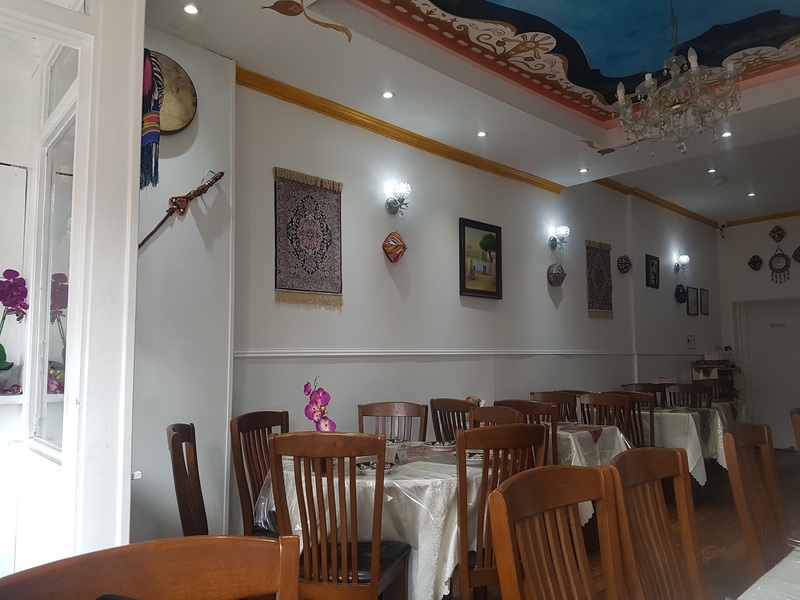 The short menu features food that connects central Asia (flat breads and lamb pilaf) with the more familiar Chinese classics (kung pao chicken and ma po tofu) with a focus on hand pulled noodles and dumplings. There is no alcohol on the menu (although I believe you can BYO), but at 11.30 in the morning, and having sunk a few in Seven Sisters the day before, I was OK with that. 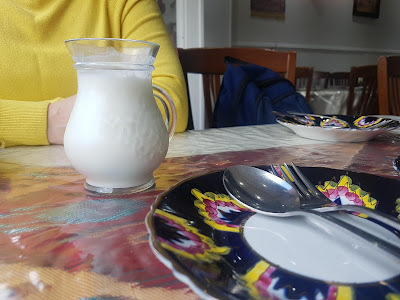 The Ewing went for her favourite ayran, a salted yoghurt drink, while I went with an icy can of Diet Coke. That authentic, life-giving, nectar. I may have talked about kidneys on the blog before, more specifically about how they are one of the few things the Ewing eschews. Even the tiny little delicate rabbit’s kidneys we ate at Le Manoir aux Quat'Saison after our wedding were politely pushed to the side. 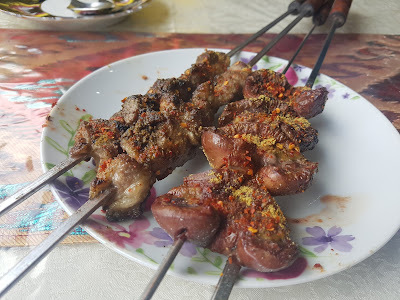 Buoyed by reading very good things about the grilled (I’m guessing lamb) kidneys here, I persuaded her to give a skewer of them a go. Reader, as usual, I was wrong. Not only did she refuse to eat them, but I remembered I really wasn’t much of a fan. 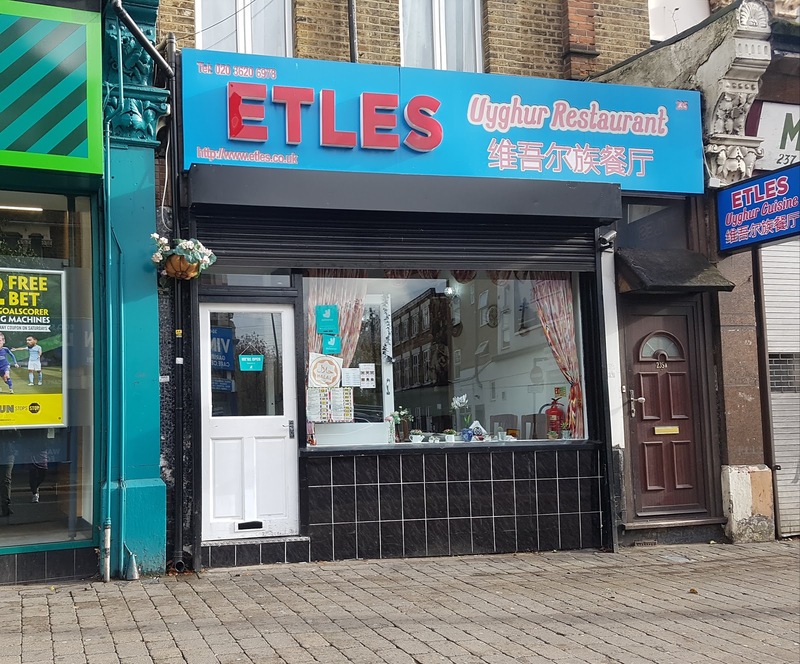 Especially with the faint prickle of a hangover, amplified by the liberal sprinkling of chilli, bouncy texture and the faintly uric tang, that Mr Bloom enjoyed so much, that makes eating them seem a little like a bush tucker challenge. If you like offal then certainly don't let me put you off. I still finished them all, and was glad I did, but I much preferred the skewers of lamb - smoky from the grill and slightly chewy with little chunks of sweet, charred fat. A very good introduction of what was to come. 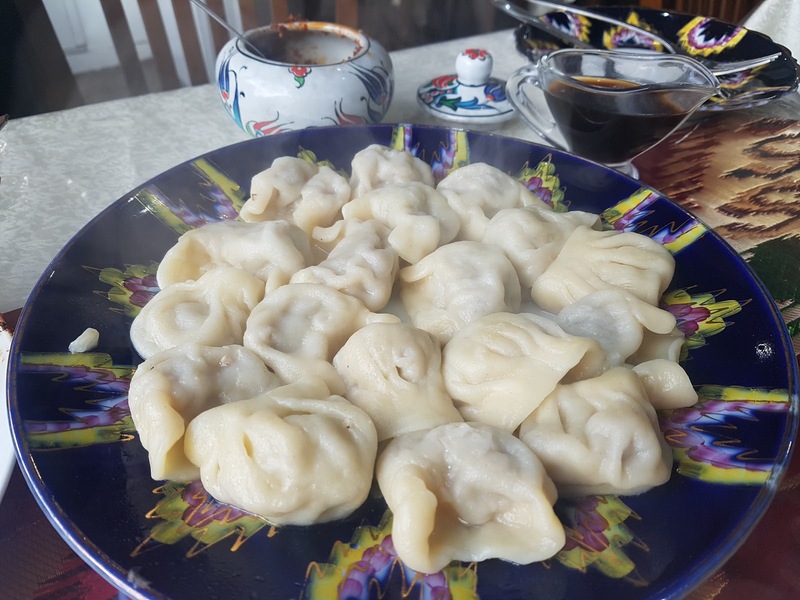 The boiled turgur dumplings are very similar to jiaozi (think Jen Cafe in Soho), with thick, springy wheat flour wrappers although they are filled with 'chopped calf', instead of the more familiar pork. Like their more famous bretheren, they are served with black vinegar and chilli oil for dipping, . although they also serve smaller dumplings, shaped a bit like tortellini, filled with lamb and onion and served in a broth. Hand pulled noodles come in three varieties. 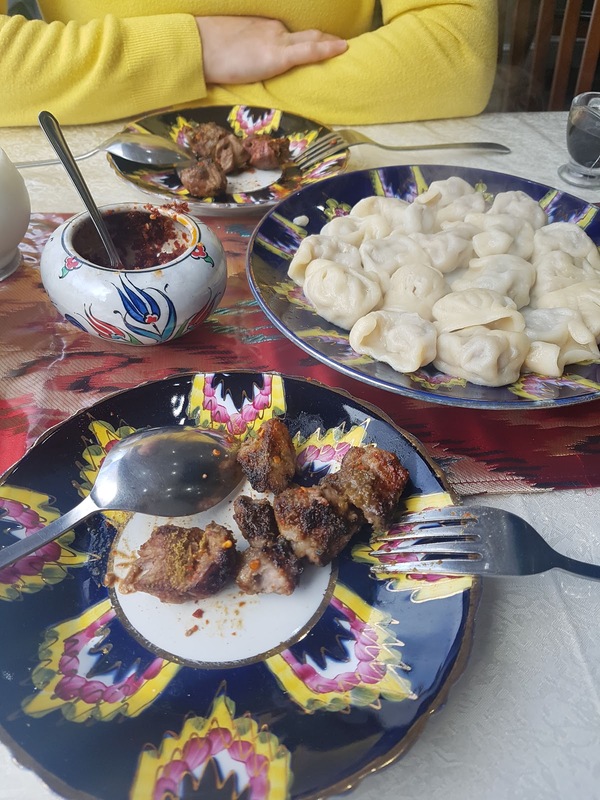 There are flat, ribbon like noodles in the served in Da pan ji (‘big plate chicken’) – a stew also featuring spuds, chicken and plenty of Sichuan pepper. 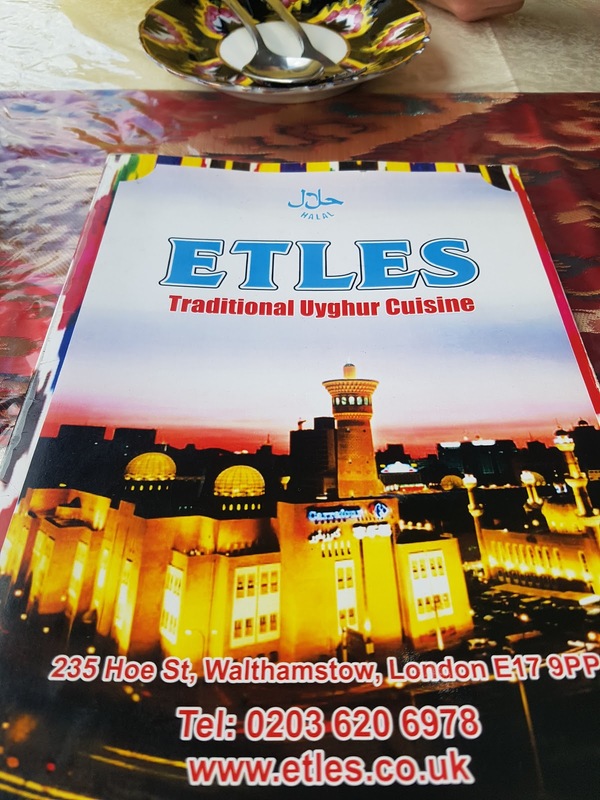 Possibly the most famous dish of the region, this is one many people may be familiar with from trying at Silk Road in Camberwell. Thinner noodles – similar to pici or udon - are served as lagman, a dish of boiled noodles with a separate bowlful of meat sauce, or chaomian (also known as dingding somän) where the noodles are cut into short lengths and are wokked with beef or lamb, peppers and tomato. 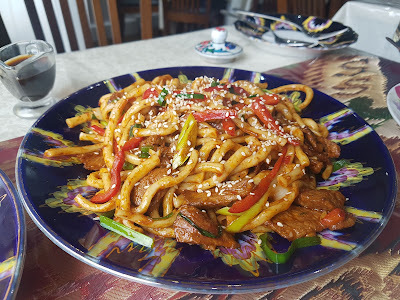 We went for the latter, and were rewarded with a deep meaty sauce and chewy noodles, sprinkled with sesame seeds, that together tasted like the dashing love child of a spag bol and a stir fry. We were too full for the homemade honey cake, but the Ewing did take a handful of sweets that accompanied the - eminently reasonable - bill, to keep her going on our next leg of our trip, to the Wild Card Brewery. 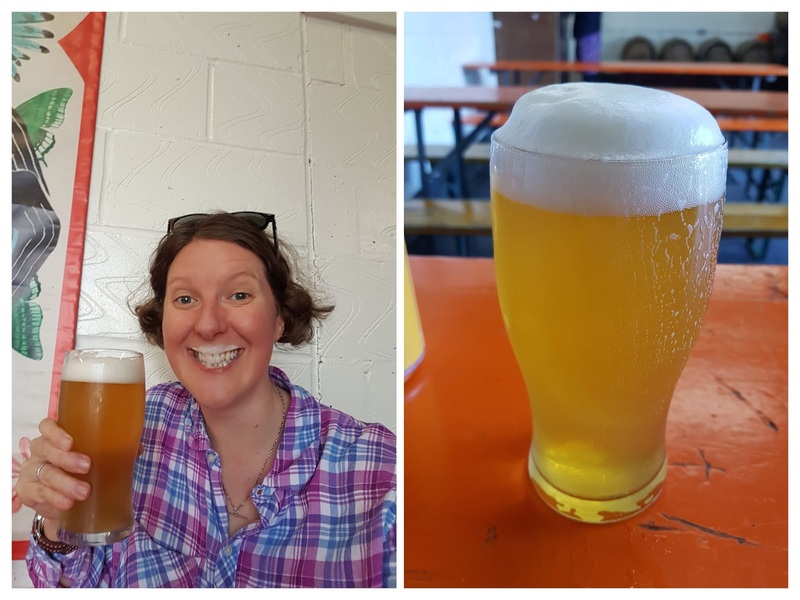 Here we carried on celebrating the end of my self-imposed booze free month (lets not talk about last Friday) with a pint of their super lovely and extra frothy, neipa. All donations for my Movember efforts gratefully received for the beer fund. I've got some catching up to do over Christmas.